Three men stand on a sidewalk in San Francisco. They stand equidistant from each other, not even their shadows touching. In any event, they are more engrossed in the smartphones they hold than in anything going on around them. With heads bent forward, they click away; two of them are further buffered from their environment by sunglasses and headphones. Their backs are to a colorful mural of a hillside and waterfront, perhaps imagining San Francisco as it was in the days of Spanish rule. They do not notice the woman depicted in it who appears to gaze out at them as she kneels to collect water, perhaps marveling at a future world that bears little resemblance to her own. These Facebook employees wait at a municipal bus stop at 24th and Valencia Streets in The Mission for the free, private bus that will carry them to the headquarters of the social media giant in Silicon Valley. Unlike the muralist Marta Ayala, whose Roots and Frequencies Basic to Our Education (1994) they ignore, they are likely recent transplants to The Mission–drawn by its reputation as a hip, artsy neighborhood, and proximity to the 101 freeway that will give them a shorter commute on top of workweeks in excess of 40 hours. Young digital “creatives” such as these men, have been moving to San Francisco in droves since the original dot-com boom of the late ‘90s. Since 2006, this has been accelerated by the so-called “Google Bus,” private buses that connect desirably “urban” Bay Area neighborhoods with the suburban campuses of Apple, Facebook, Yahoo! and others. Today, the private buses carry tens of thousands on a daily basis, siphoning riders from the region’s transit systems and causing public outcry. The displacement brought about by this influx of new arrivals is nowhere more fraught than in The Mission, previously a lower-rent neighborhood that provided an accessible home for generations of San Francisco’s immigrant communities–first Irish, German, and Polish, then, starting in the 1940s, Mexican and Central American. For decades, The Mission was the Latin@ heart of the city, its walls adorned with murals in styles traditional in Central America, and its parks hosting altares for the celebration of Día de los Muertos in the fall. All of this fused syncretically with the broader city culture to produce something uniquely San Franciscan and uniquely “Mission.” But now, another mural around the corner from Ayala’s shows a parade of well-known residents carrying banners that read “Stop the Evictions.”While it could be argued that urban spaces are dynamic and constantly evolving, and that the Techies are just another wave of immigrants using the Mission to gain a foothold–the digital isolation of the Facebook employees waiting for their private bus tells a different story. SF residents who are being forced out due to higher rents and condo conversions they cannot afford are multi-generational families, small business owners, teachers, first responders, artists, activists, and performers, and service workers of all kinds. They are also largely from communities of color. The more recent arrivals have demographics that match the tech industry’s, 64% white (1) and 74% male (2). They are also young, typically unmarried or child-free, and earn extravagant salaries: in 2012 the mean annual salary for a network specialist was $94,000 (3). The young tech workers I documented are not just demographically distinct from the communities they are uprooting, they have a dramatically different relationship to place. For these dwellers in what Zygmunt Bauman calls “Liquid Modernity,” (4) San Francisco is just another node on the global network of IT capital. Today they live in SF, but tomorrow it could be New York, Tokyo, or Stockholm. In order to cope with these repeated disjunctures, they must buffer themselves from the particularities of place. Local culture becomes something briefly consumed and easily discarded. The continuity of liquid modern life is in the data flows that travel with creatives, evident in the men’s fixation on the screens of their devices. They feel more closely connected to remote people and events than to their co-workers standing only feet away. The privacy of the tech buses helps sustain their illusion of being “alone together,” to quote Sherry Turkle; like much of the tech created in Silicon Valley, the buses allow riders to “‘dial down’ human contact, to titrate its nature and it’s extent.” (5) For the tech industry to use public rather than private systems for its transportation needs, its members would first have to become part of the “public” of the places they inhabit. 1) Pepitone, Julianne, “Silicon Valley fights to keep its diversity data secret,” CNN Money, 9 Nov. 2011, http://money.cnn.com/2011/11/09/technology/diversity_silicon_valley/, (accessed 10 Feb. 2014). 2) U.S. Department of Commerce,“Women in STEM: An Opportunity and an Imperative” 3 Aug. 2011. http://www.commerce.gov/blog/2011/08/03/women-stem-opportunity-and-imperative (accessed 10 Feb. 2014). 4) Bauman, Zygmunt, Liquid Times, (London, Polity: 2007). 5) Turkle, Sherry, Alone Together, (New York, Basic Books: 2012), 15. After review it was discovered that some entries to the 2014 RTMP competition were longer than the guidance issued on character count. In fairness to those who submitted entries, all submissions were judged equally. In the interest of transparency and fairness, these issues have been identified and resolved in our preparation for the 2016 RTMP competition. 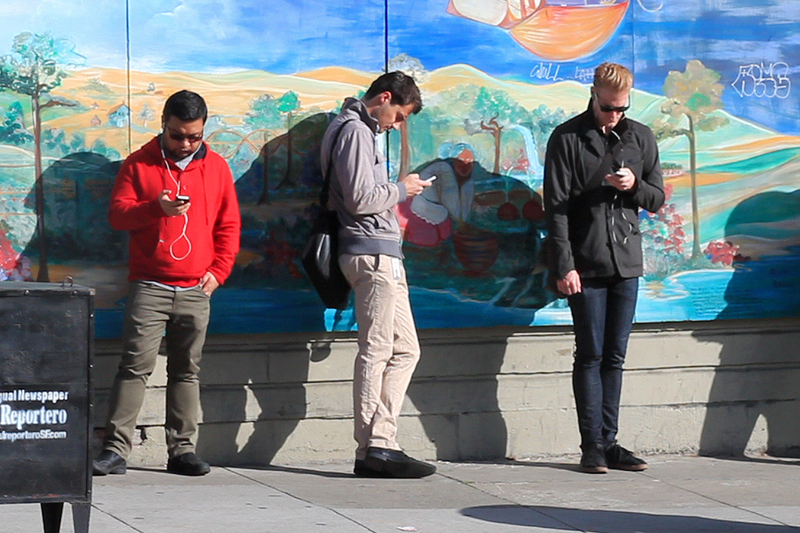 Rachel Tanur's photograph illustrates a social relationship that is very different from the deliberate distancing practiced by the young, male Silicon Valley workers I captured waiting for a Facebook bus. Absent are the hallmarks of mass transit in the U.S—reading material, sunglasses, or expensive data devices used to buffer the rider from others. In Tanur’s image, the people at the bus stop are engaged with their surroundings and their neighbors—there are conversations taking place, and snacks and goods for sale. The waiting passengers stand closely grouped, the colorful patterns of their clothes overlapping. The bus to Sololá behind them is equally bright—with red and yellow paint and a multicolored destination placard—and pops out against the bright blue of the food stand in the background. The accumulation of details in Tanur’s composition produces a significantly different effect from the setting of my photograph: regardless of whether these people are traveling to work, to see family, or to conduct business, their transit space seems lively and inclusive. The techies, waiting for a bus that will carry only those with the right employment credentials and social capital, are walled off from each other and utterly disengaged from their environments. In the view of Henri Lefebvre, spatial relations are produced by and reflective of social relations (1). This observation applies not only to cities or regions, but also to the systems and technologies that connect them, such as public transport. This dynamic is manifest in the very different experiences produced by the spaces of transit in the hyper wealthy SF Bay Area and impoverished rural Guatemala. It is a marked irony of the tension over the exclusive “Google Buses” that in most of the world, buses are a cheap, populist mode of transit. Even in the U.S., municipal buses are the most common form of state-supported transit due to their relative lack of costly infrastructure; increasing numbers of low-cost, private buses now travel the interstates as an alternative to expensive air travel, and the ailing Amtrak system. But, of course, the car is the preferred mode of transportation in the U.S., and is heavily linked with notions of citizenship (the driver’s license is the default form of ID), wealth and class status, and autonomy. For Americans, discomfort with public transit is due in part to the fact that few use it as their primary or only mode of transportation; in 2010 there were 797 vehicles per 1,000 U.S citizens. By contrast, in Guatemala, there are only 68 (2). 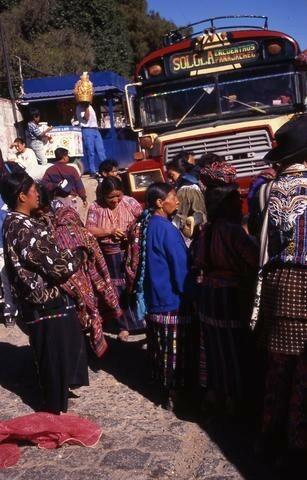 Most of the 68 vehicles per 1,000 Guatemalans are buses. To cope with extreme poverty, income inequality, lack of social and geographic mobility, and widespread failure of public train and bus services, Guatemala has developed an expansive network of cheap, private buses that serve almost every community in the country. The majority of these are repurposed school buses from elsewhere in the Americas, repainted with eye-popping colors like those on the bus to Sololá, and with even more spectacular, mural-like decorations shown in other images from Tanur’s travels. The buses are crowded and not particularly comfortable, but they are democratic in this. The experience of travel by bus produces a communal space that begins in the social scenes of their many stopping locations, flows into the buses’ cramped confines, and then feeds back into the communities they connect. Given that others of Tanur’s photos were taken at Lake Atitlán, near Sololá, I imagine these images were taken while she herself was traveling the country by bus, making her images both an outside and an inside view of this important aspect of Guatemalan social life. 1) Lefebvre, Henri, "State, Space," World, (Minneapolis, MN: University of Minnesota Press, 2009), 186. 2) The World Bank, “Motor vehicles (per 1,000 people),” http://data.worldbank.org/indicator/IS.VEH.NVEH.P3 (accessed 17 Feb. 2014).